A forgotten Dublin census. | Come Here To Me! « An elephant tusk and a picture of Wolfe Tone. It’s likely many of you have lost hours of your lives to the 1901 and 1911 census returns. 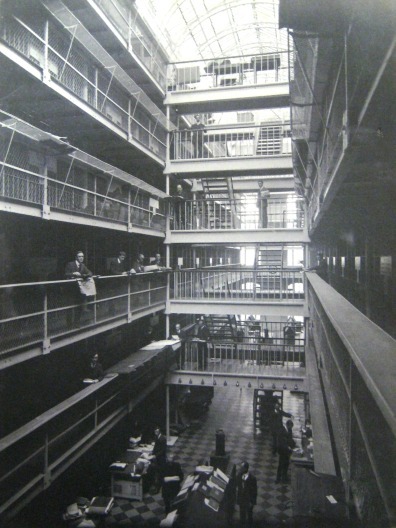 Both digitised and freely available online, they are a great insight into life in Dublin over a century ago. We’ve looked at them in some detail on the site, for example exploring foreign nationals in the 1911 census, and unusual religions. For those interested in the population of Dublin historically however, there were surveys carried out long prior to the two census’ online today. One such brilliant source is ‘Whitelaw’s Survey’ from 1798. The story of that undertaking is caught up in the political violence of the time. Some of this amazing survey is available to read online today, and it is linked to later in this piece. 1798 has entered Irish history and consciousness as being synonymous with revolutionary agitation and the cause of the Society of United Irishmen. Backed military by France, 1798 saw attempts at revolution in the Irish countryside, spearheaded by a revolutionary organisation which included Protestants, Presbyterians and Catholics in leadership positions. In the tradition of Irish rebellions is was both romantic and brief, though the 1798 rebellion did lead to an intense security crackdown from those in authority. As a security measure, the Lord Mayor of Dublin issued an order to the populace of the city, that they would affix a list of inhabitants for each home to the front of their dwellings. Whitelaw, James, Rev., author and philanthropist, was born in the County of Leitrim, about 1749. He was educated at Trinity College, Dublin (where he took his degree of B.A. in 1771), and entered the Church. The living of St. James’s, in the Liberties of Dublin, and afterwards the vicarage of St. Catherine’s in the same locality, were conferred upon him. He laboured indefatigably among the poor, establishing schools, industrial institutions, and loan funds. …my assistants and I, undeterred by the dread of infectious diseases, undismayed by degrees of filth, stench and darkness inconceivable, by those who have not experienced them, explored, in the burning months of the summer of 1798, every room o these wretched habitations, from the cellar to the garret, and on the spot ascertained their population. Whitelaw was particularly concerned with the density of population not only to highlight the extent of the poorer districts but also to derive mathematical rules of thumb which could be applied to calculate the populations of other comparable European cities. His calculation of population density applied to buildings only and he outlined precise geometric procedures for the exclusion of open spaces such as Stephen’s Green, for example. 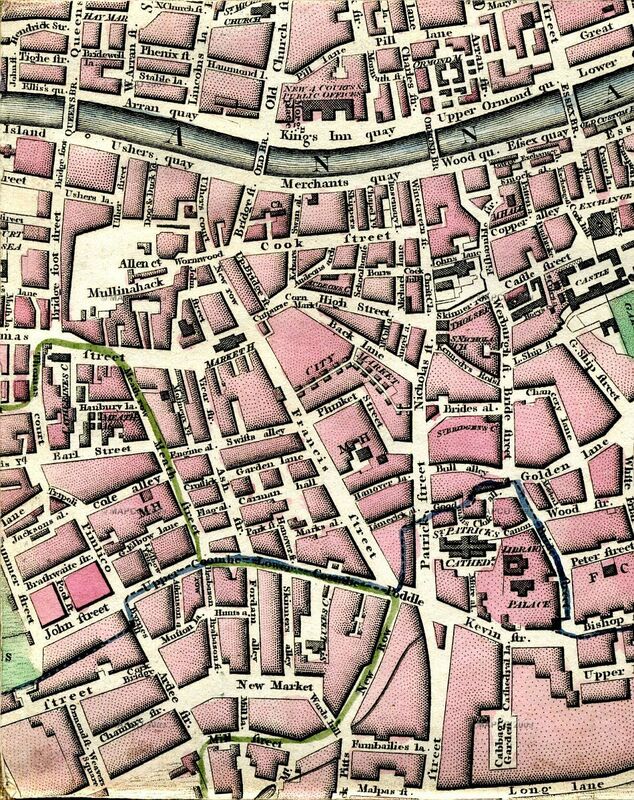 The parishes within the old walled city were much more densely populated than the newer up-market suburbs, ranging from a claustrophobic 439 persons per acre in St Michael’s (opposite Christchurch) to a more comfortable 87 per acre in St Thomas’ (Sackville Street/Gardiner Street area) (By way of comparison, the population density of Dublin in 1981 [according to the Central Statistics Office] was only 20 persons per acre [approximately], but calculated over the whole city, open spaces included.) Whitelaw contended that, provided accurate maps were available, the populations of other cities could be geometrically determined by extrapolating from the actual Dublin experience. 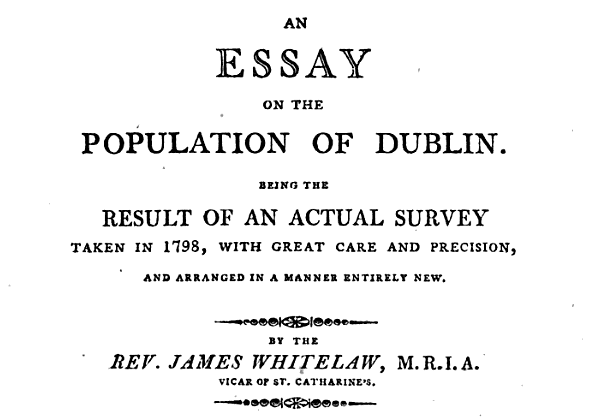 Some of his findings were published in 1805,as An essay on the population of Dublin being the result of an actual survey taken in 1798, with great care and precision, and arranged in a manner entirely new. Today, this work is freely available to be read online. Observe the level of detail present in the work. 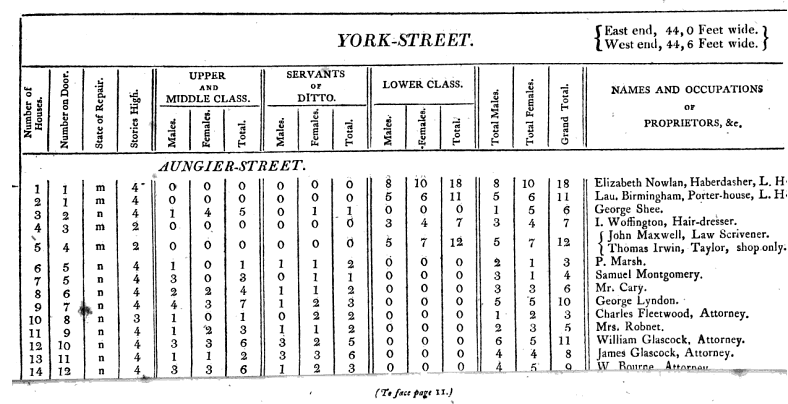 Here is an entry for York Street, notice that Whitelaw has noted the number of the house, the number upon the door, the state of repair, how many stories high the home was, the social class of the inhabitants, their names and their occupations. An excerpt for the work. He was constant in his ministrations at Cork Street Fever Hospital, where on one day he administered the sacrament separately to six patients in the last stages of malignant fever. The result was that he caught the disease himself, and died, 4th February 1813, aged 64. I remember reading this and some other aspects when researching a bicentenary exhibition on the rebellion and Dublin in 1798. Not long before the census was taken there was a storm and he found people(30) living huddled in a corner of a house on Schoolhouse lane. Half the house had collapsed yet the landlord had refused to do any repairs and kept charging the same rent. The residents were only saved from death in the first place because the house collapsed outwards and fell and killed a herd of cows in the yard across from it. Excellent article. It’s hacks me off every time I am reminded of the burning of the records office. To have gone to every home and interviewed every person, truly is taking great care. on January 8, 2016 at 12:04 am | Reply Minding books in dangerous times. | Come here to me!